Shorthand is a five-piece punk band from Scranton, PA that likes to combine the fast and melodic elements of the genre. Now, I’m sure as soon as people read that location, they instantly think of bands in/around Scranton like Title Fight, Tigers Jaw, Balance and Composure, Daylight and Captain, We’re Sinking. Those are all bands that can probably be placed in some sort of “punk” genre, but have definitely made their own unique marks. 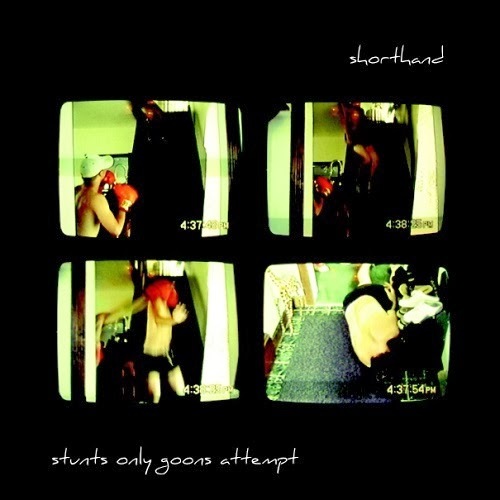 After listening to Shorthand’s debut EP, Stunts Only Goons Attempt, I feel this band can easily get to the same level as some of its fellow Scranton punk musicians. The EP starts off nice and fast with “Kokiri,” which is a song driven by an aggressive punk beat. Instantly, you notice that these aren’t your typical punk vocals. It almost sounds like there’s some subtle vibrato in some parts. There’s also a very nice melodic section towards the end of the track. The song is definitely a very strong start to Stunts Only Goons Attempt. “Nameless” starts off pretty dark, with some very heavy sounding guitar riffs – and some drums that force you to bob your head. Have no fear, though, because you’re quickly thrown into a punk beat with some intense vocal harmonies to match. “Nameless,” from that point on, stays fast – until reaching the end, where it gets a bit dark again. “Keep It” starts off with a bit of the same feel as “Nameless.” Of course, the similarity does not take away from the extremely captivating, vibey intro to the song. The chorus is very heavy sounding and fast, but eventually goes back to the same vibe the intro presented. The song manages to switch between the two vibes one more time, and then it ends really strong. I would say “Keep It” was an instant favourite. Following that roller coaster of a punk song is “Try Hard.” This track feels a bit more traditional, as it’s a very upbeat punk song. The vocals are really interesting on this one; they seem to reach more of a point that is closer to yelling. I think what makes it interesting is that the most upbeat sounding song has some of the most aggressive sounding vocals. The closing track of Stunts Only Goons Attempt, “Ten Toes,” is easily the most melodic on the entire record, and it’s tastefully saved for last. This song carries all the elements that Shorthand brought into the light throughout the whole EP: super melodic riffs, fast punk beats, harmonies and all of the vocal styles. It’s a great way to close the EP. The ending is especially strong – presenting some beautiful, almost haunting harmonies. Overall, I don’t think the band is trying to redefine the genre or anything like that with this EP; I think the members are just trying to make good punk music that’s easy to enjoy. It seems that most bands who played this type of music either toned things down or went down the fuzzy shoegaze route. I think if Shorthand plays their cards right – and progress with the sound they already have – they will do great things this year. It’s really simple when it comes down to what this EP is; it’s melodic, catchy, fast, heartfelt punk rock. With the right people supporting them, Shorthand could be the next band to break out of Scranton and do big things.